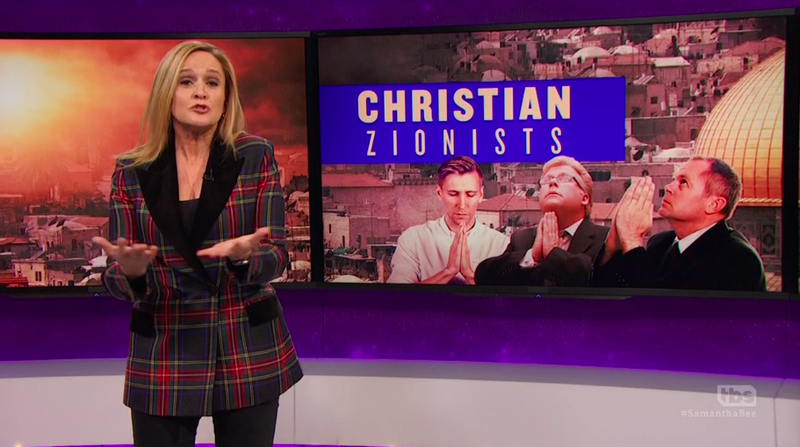 Sam Bee examines evangelical responses to Trump, from quitting in protest to "Aryan death cult"
On her last Full Frontal before the holidays, Samantha Bee, appropriately enough, took most of the episode looking at how supposedly devout Christians have continued to support noted [fill in the deadly sin of the day] enthusiast Donald Trump. Especially those evangelical Christians whose rigid adherence to the most literal and dogmatic interpretation of godliness have nonetheless seen them remain Trump’s staunchest base of support. (Perhaps tied with white supremacists, men’s rights activists, anti-LGBTQ bigots, and bilionaires not super into paying taxes, depending on the day.) What she found could be roughly broken down into, as she put it, “fringe-dwelling internet lunatics” versus those who think of the Bible’s whole “peace, love, and charity” vibe as something more than justification for denying gay guys a wedding cake. On the other hand, Bee’s interview with New York megachurch Pastor A.R. Bernard at least suggested that some members of the evangelical movement actually practice what that Jesus guy preached. The only member of Trump’s board of evangelical advisors to resign in light of Trump’s decidedly un-Christian actions, the gamely smiling Bernard responded to Bee confessing that she feels “like [she] physically wants to vomit” every time Trump talks about religion by assuring her that she’s not alone. Sure, Bernard didn’t mention vomit, but he did confess to knowing that he had to resign from Trump’s evangelical pep squad of enablers within 15 minutes of their second meeting. Asked by Bee if he thought Trump had mistaken him for Ben Carson, the African-American Bernard laughed that he hoped not, but that it was abundantly clear that Trump, as opposed to being open to Bernard’s perspective as a “minority voice at the table,” was, instead, “a person who was fascinated being where he was.” After Trump’s equivocating excuses for torch-wielding Nazis in Charlottesville, Bernard said, evangelicals and other Christians have to “decide what you are willing to stand for, what you are willing to fight for.” Continuing, Bernard asked, “What are you giving in exchange for your life, for your reputation.” Sadly, for most other evangelical Trump supporters, the answer seems to be, literally, everything, up to and including all life on Earth.